Our live design software is the perfect solution for interactive product design at events. Using custom text, preset graphics, user uploaded images or stock photography our software allows users to engage by creating a 100% unique product. Our first use of this software was during the Microsoft Windows 10 launch, whereas the guests of private event created over 400 unique canvas bags that were submitted with user generated settings + guest name. We have created these unique software solutions for clients like NASCAR, adidas, American Express and AT&T. We create B2B software solutions for our print partners to help enhance the overall experience for everyone at events nationwide. Our software not only aids in the creation of amazing custom products but acts as a stable and easy to use organization system for event coordinators and live print teams. Integrate your brand image into a custom design station this white label solution. Create splash cover pages showcasing your latest brand announcement. Its a touch sensitive web based app that can be accessed from mobile phones, ipads and desktop computers. Users have the ability to select product, then select their product options like size, color, style and then are able to design the item from blank. All of the product options can be customized based on product details. Once an order is submitted a print ready file is placed into an order and are easy to manage for the event team. 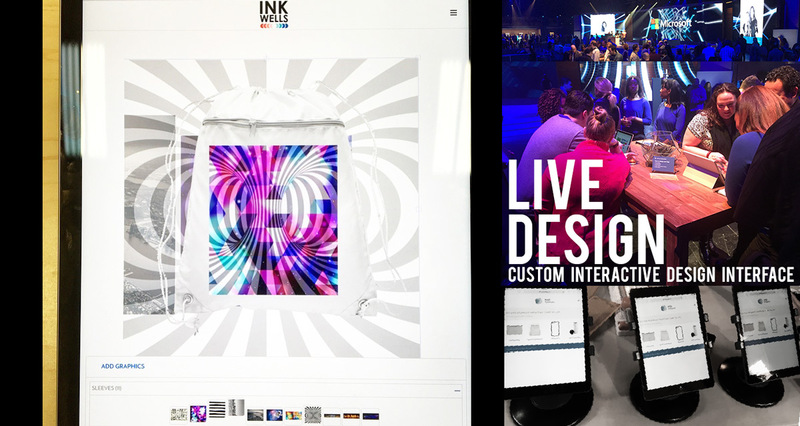 Use our Live Design software with our Live Printing Service.